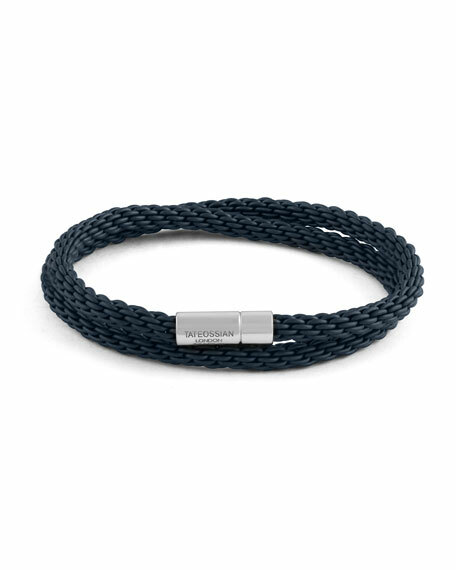 Tateossian "RT" bracelet in braided rubber strands. Sterling silver clasp with logo. Konstantino men's Stavros bracelet with 18-karat gold trimmed cross cutout. 360 degrees of design. 0.06 carat black spinel stone embellishments. Konstantino men's Stavros bracelet with 18-karat gold trimmed cross cutout. 360 degrees of design. 0.06 carat black spinel stone embellishments. Intricate hand-etched sterling silver. Pinch box clasp. Approx. 8"L x 0.63"W. Handmade in Greece. Mr. Lowe men's vinyl and diamond bracelet. Four-row diamond pav?? sterling silver bead. 8mm green and black vinyl disc beading. Mr. Lowe men's vinyl and diamond bracelet. Four-row diamond pav?? sterling silver bead. 8mm green and black vinyl disc beading. 1.34 total diamond carat weight. Stretchy; slip-on style.